With 17 years of experience in developing Sports specific class programmes to improve the performance of both individual athletes and teams, our programmes have proven to be successful with professional sportsmen and women. In the past we have worked with All Blacks, the Breakers, Olympic Swimmers and Sailors and many other sports people. We are currently training professional dancers and Olympic kayakers. All of the Sports people we train are looking to improve their sports performance, reduce injuries and when injuries occur, we improve recovery time. We can do the same for your Teams. Our objective is to assist and support you by developing programmes specifically to meet your team’s needs. 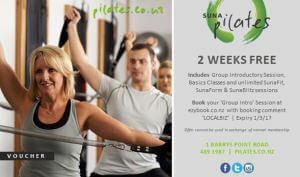 Once you know what Suna Pilates is all about, we can talk you through our programs options and how they can best work for your teams. If you would rather send some of your coaches, please let us know.